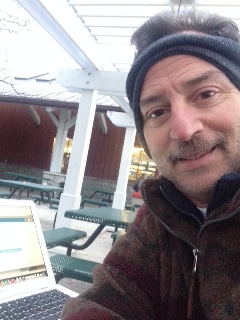 I am at a rest stop on the New York State Thruway. I decide to adapt to my environment. I rest. Beyond the trucker in his 18-wheeler Midland who is munching on his McDonald’s are the Catskills showing off their stunning Autumn colors. Just ahead unveils evidence that this very Fall-ish day is also Halloween. A rather puffy figure in a black flowing robe that hide his feet glides into the Rest Stop. To my left is a man in a brilliant costume sporting a neon, zippered vest. And two lovers dressed to the T stroll past the trellis garden near my parked spot. This latter couple wear costumes that most of us wish we could fit into. The significant thing about these sightings is that they are not Halloween costumes at all. The portly robed man is actually an Orthodox priest and the vested man is a groundskeeper who works at The Thruway Rest Stop sweeping near the curb while the lovers are…ahhh, oh-so-real. Halloween reminds us of the costumes we choose to wear each day. Daily, some wear ghoulish threads while others stick out their chests. In my last writing, I mentioned how Mary Magdalene was so wrapped up in looking for a dead Jesus that she didn’t recognize Him when He was standing in front of her. If she was thinking of Jesus solely as a man, it’s only natural that she’d want to recover His dead body and return it to the grave. She knew him as the guy who was “so human.” However, Mary was so into Jesus’ humanity that she missed His divinity. This could explain why her only concern was with the recovery of his lost or stolen body. This is where the God-human or human-God gets tricky. Sometimes, the opposite occurs. We get so immersed in His divinity that we find it hard to understand how He could possibly relate to us as a human. Yet, Mary’s lesson is also our own. We can get cynical about His empathy with us mortals because we figure He had the unfair advantage of being God while walking around in skin. Are we subtly telling ourselves that He didn’t really suffer the way we do because he had some cosmic threshold of pain? What’s a believer to do? Jesus answers this question by rewarding Mary’s quest. She sought Him and He was going to make sure she found Him. Yes, she was off in presuming that He was dead and gone forever. But Jesus is concerned about the heart. Here was a lady that was literally following Jesus to the grave. It’s obvious by her consternation about His body that she loved Him beyond words. Jesus kindly solves her riddle because He knows she got the first part right in a good way. He WAS human and suffered and she was there to witness all of it. Now, it was time for the perplexing part. He would rent the veil between heaven and earth and allow her to “see” the God-Jesus. Mary finds out what all of us must discover if we are to fully appreciate His inherent goodness and the most audacious claim He made while on earth: that we who are human would get to be like the divine. Is this why Jesus is referred to as “the firstborn of the dead?” (Revelation 1:4,5) Like Mary, you never know what you will discover on an Easter morning. It’s beyond our imagination that somewhere beyond the sky is an eternity where His Mary-like followers will be raised forever. 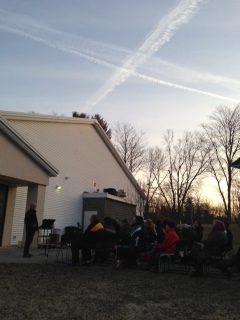 SOMEWHERE BEYOND THE SKY: At our Easter Sunrise Service, a large cross appeared in the blue sky as if to suggest that the divine truly intersects with humanity.